PT Yodya Karya (Persero) - Yodya Karya or commonly abbreviated as YOKA is Jakarta-based state-owned consulting services company. YOKA has core business competencies in construction and non construction industry. Its business include consultant planner services, including architects, engineering and management consultant services. PT Yodya Karya (Persero) is a non listed state-owned company and is completely owned by the government of Indonesia. PT Yodya Karya (Persero) was formed in 1946 as a Dutch company named Naamloze Vennootschap Job en Sprey (NV Job & Sprey). In 1958, NV Job & Sprey was officially nationalized by the Government of Indonesia under the name of PN Yodya Karya. 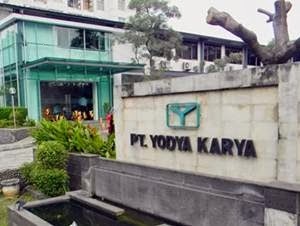 The name PT Yodya Karya (Persero) officially launched in 1972. YOKA now has 5 regional offices, 5 branch offices and also supported by 3 division units, namely Engineering Division, Building Division, and PLKP Division. PT Yodya Karya (Persero) performance achievement throughout 2014 showed satisfactory results. YOKA registered a 10.48% growth in total revenue value of Rp185.5 billion as compared with Rp167.9 billion in 2013. YOKA managed to record a total profit of Rp10.7 billion at the end of 2014 or equal to an increase of around 27.38 compared to Rp 8.4 billion in the previous year (2013). This figures was stated by the Indonesian State-Owned Enterprises Profile 2014 issued by the Ministry of State-Owned Enterprises as cited by JobsCDC.com. Minimum GPA of 3.00 (PTN) and 3.25 (PTS) within 4.00 scales. Minimum 1 year of experience. Fresh graduate are encourage to apply. Thorough, honest, and highly motivated. Able work in team and responsible for the job. JobsCDC.com now available on android device. Download now on Google Play here. Please be aware of recruitment fraud. The entire stage of this selection process is free of charge. PT Yodya Karya (Persero) - D3, S1 Fresh Graduate, Experienced Staff Yodya Karya May 2017 will never ask for fees or upfront payments for any purposes during the recruitment process such as transportation and accommodation.